Along with Konrad Mägi and Ants Laikmaa, Nikolai Triik is among the most important artists of the beginning of the 20th century whose work led to a breakthrough in Estonian art. Triik was closely associated with the cultural grouping Noor-Eesti (Young Estonia, it consisted mostly of writers), which was active primarily during the first decade of the 20th century and set making Estonia’s culture more modern and international as its motto. In this they succeeded. Triik’s creative work of that time brings together both nationalist aspirations and international influences. He travelled a great deal and among others spent longer periods of time in St. Petersburg, Norway, Paris, Berlin and elsewhere. Starting in the 1920’s, Triik was active mostly as a teacher at the Pallas Art School. 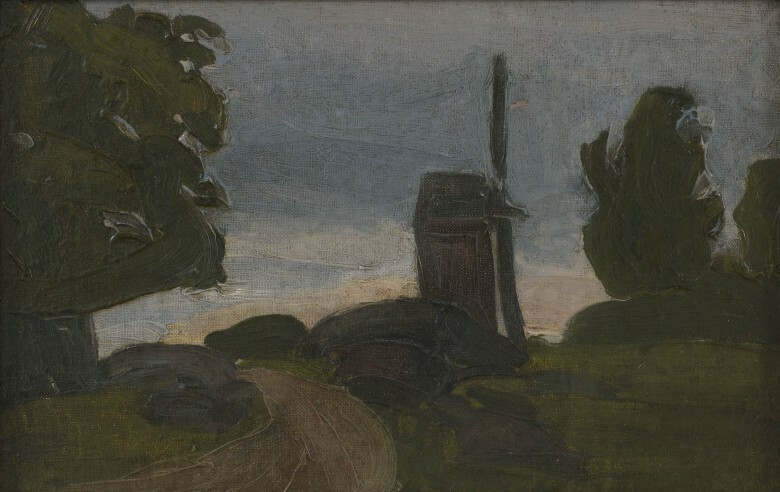 "Landscape with Windmill" belongs to a series that Triik completed in the summer of 1906 when he was vacationing in the Aland archipelago. Fewer than ten works of this same series were known by 1969. 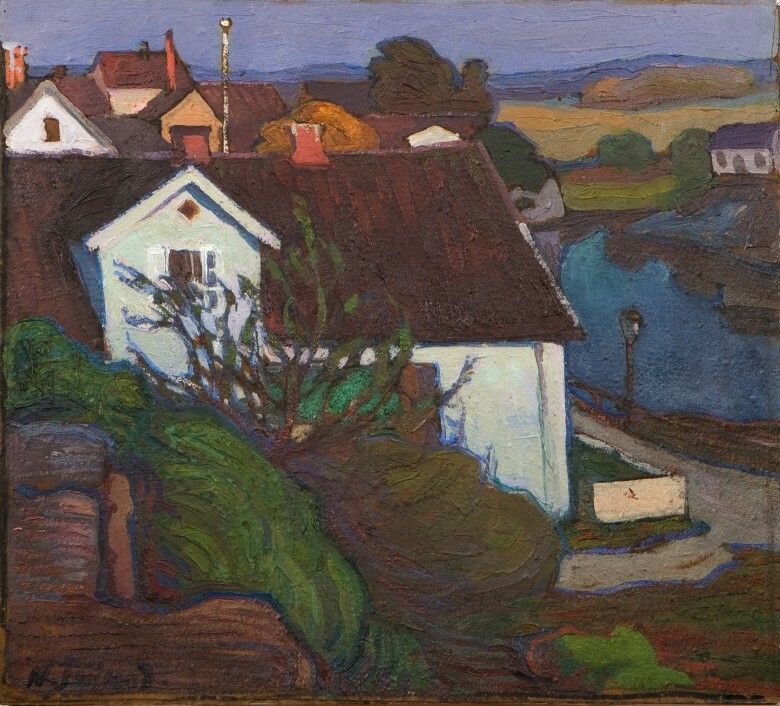 Triik lived on Aland for three months and this became a period for himself and other fellow artists (including Konrad Mägi) for getting away from the urban environment. The artists began seeking new inspiration from the Nordic landscape. The artists stayed on Aland in the village of Önningby, five kilometres from the capital Mariehamn. Önningby had by then become a summertime colony of Nordic artists. Triik participated in exhibitions as well with works completed on Aland. A number of works completed on Aland were on display in June of 1906 in Tallinn, and at a charitable exhibition held later in Haapsalu. “It can be presumed that landscapes, which Triik so avidly painted on the island that through his own example, he even managed to convince Konrad Mägi to abandon sculpture and to devote himself to landscape painting, dominated among the works sent,” writes Evi Pihlak. 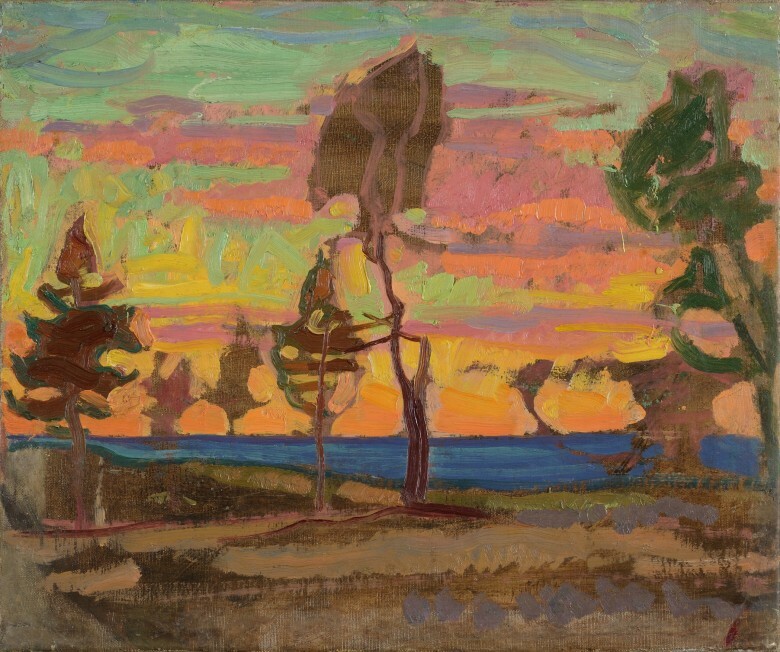 Triik also participated with landscape paintings from Aland in the first exhibition of Estonian art in Tartu in 1906. It is possible that this double-sided work "Landscape with Windmill" was also among the works of those two exhibitions. Triik stayed in different places in the years 1905 to 1909: in Tallinn, St. Petersburg, Finland, Aland, Paris and Norway. This work was also probably completed in Norway (where Triik was in 1907 and the summer of 1908). Many Estonian artists went to Norway at that time (Konrad Mägi, Aleksander Tassa, Roman Nyman, Jaan Koort), inspired by the culture and natural settings of the Nordic countries – as was much of Europe of that time. Influences of Norwegian art can also be seen in Triik’s creative work of that time. Nikolai Triik was Estonia’s most important expressionist, who often depicted situations affected by the anxious moods of the outset of the 20th century. Triik was one of the few Estonian artists to also paint people and groups of people, and also historical allegories and works based on myths. 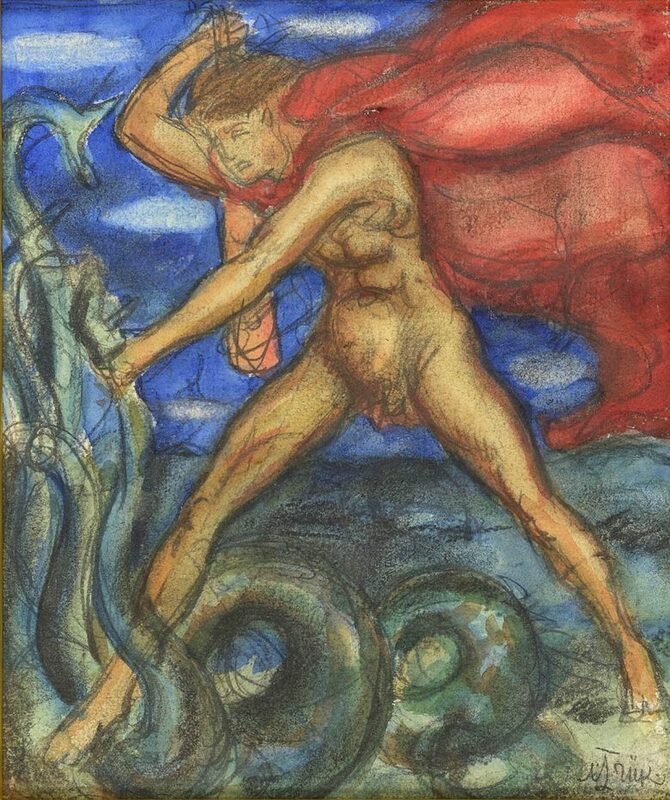 Struggle against the Hydra is a powerful expression of the subjective feeling that every time a new difficulty is overcome, yet another new difficulty arises in its place. This can be associated with public events (the First World War) as well as Triik’s personal life, which went through several low points. His dramatic use of colour merits particular attention: a fluttering red cape and the dark blue sky. Nikolai Triik travelled to Finland in 1914 and visited Gustav and Aino Suits for a few months. Triik had known Gustav Suits, poet and leader of the Young Estonia movement since 1905, when he took the job of designing the Noor-Eesti (Young Estonia) albums and later on the movement’s periodical as well. 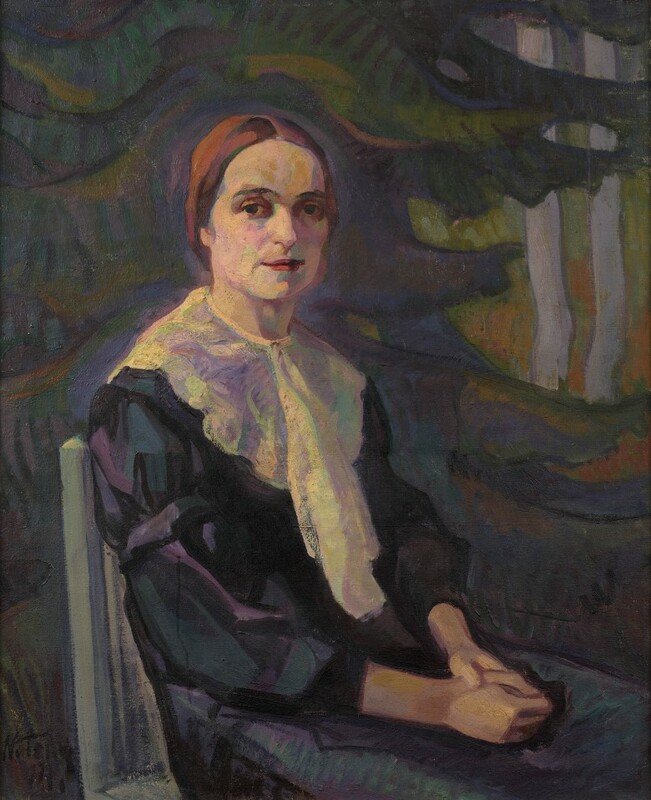 According to some accounts, Triik completed three oil paintings during that trip to Finland, one of which is this work and another is a portrait of Aino Suits. “The painter pursues a fermenting vision, accentuates the accented in languid position, he wants to achieve something summerly and airy…” wrote Suits about Triik’s visit in the poem Elu muulased (Life’s Strangers). Aino Suits was Finnish and the wife of the writer Gustav Suits. Triik was a close personal friend of Gustav Suits and his creative partner: they had worked together in the Noor-Eesti (Young Estonia) grouping and Triik had illustrated Suits’s collections of poetry. We have conversed about painting my portrait as well. He is very precise in this in order to properly understand my personality. He even compared me to Mona Lisa, that it is as if am oberörd [a Swedish word meaning ‘unmoved’]. I participate in what takes place around me yet nothing throws me off balance – his opinion. I explained that I would gladly like to be the person he thinks me to be but I am not. He says that he sometimes sees my face as that of a “good, intelligent child”. That is interesting. He’s going to start painting. We’ll see how you like it. Dear Gustav! The Triiks are here. The painting of my portrait is continuing session by session. He can say, for example: this has to be of a “darling child”, meaning of me. He respects me, he wants to understand me in order to paint a proper portrait. He is a very congenial person and somehow very familiar. Dear Gustave!...The most peaceful moments for me are my sessions with Triik painting the portrait: it is interesting to chat with him. He has managed to put my thoughts into my appearance, sent thinking of you with love (that you know that), I thought of the future for the two of us. Triik painted and painted, his eyebrows furrowed and the picture became more and more the way I myself feel that I am. I felt like a different person during the session, as if I were in a different world. It was quite odd when the painting of the picture ended that day.